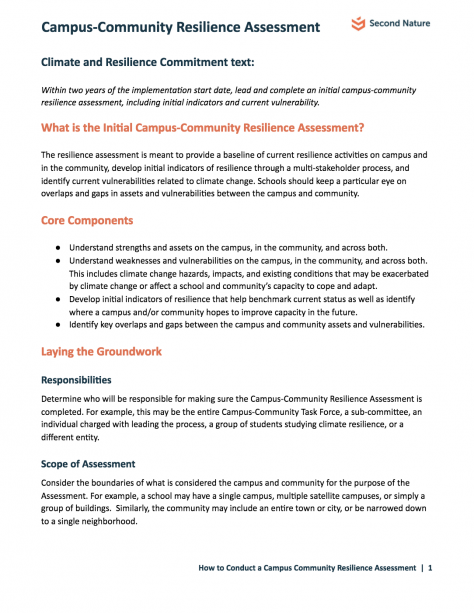 The resilience assessment is meant to provide a baseline of current resilience activities on campus and in the community, develop initial indicators of resilience through a multi-stakeholder process, and identify current vulnerabilities related to climate change. 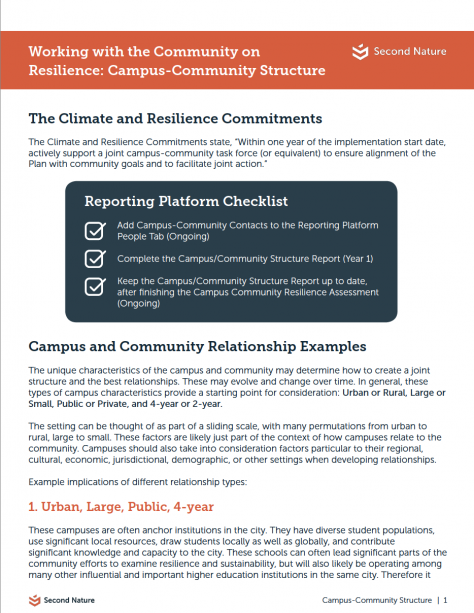 This guidance document outlines the key steps in completing a Campus-Community Resilience Assessment (Step 2 of the Climate and Resilience Commitments) and links to resources to assist with the process. Download. 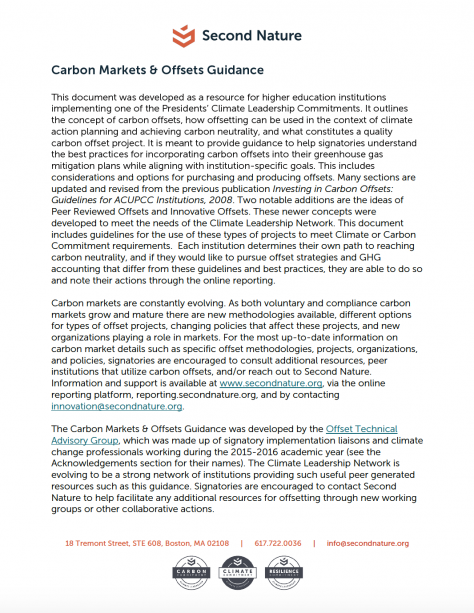 This document identifies how implementation and communication processes occur within the Climate Leadership Network, from the Steering Committee of Presidents, and from Second Nature as the non-profit facilitator. It also provides detailed information to help select a staff person for the Implementation Liaison (IL) role. Download. 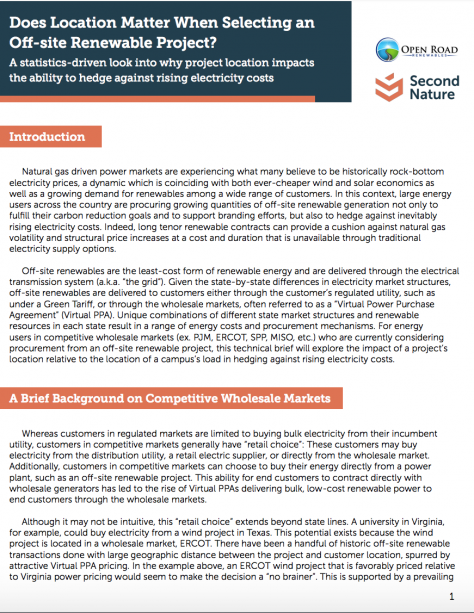 Does Location Matter When Selecting an Off-site Renewable Project? 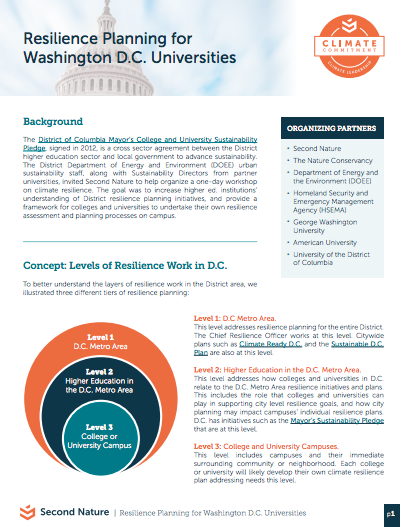 The unique characteristics of the campus and community may determine how to create a joint structure and the best relationships. These may evolve and change over time. In general, these types of campus characteristics provide a starting point for consideration: Urban or Rural, Large or Small, Public or Private, and 4-year or 2-year. Download. 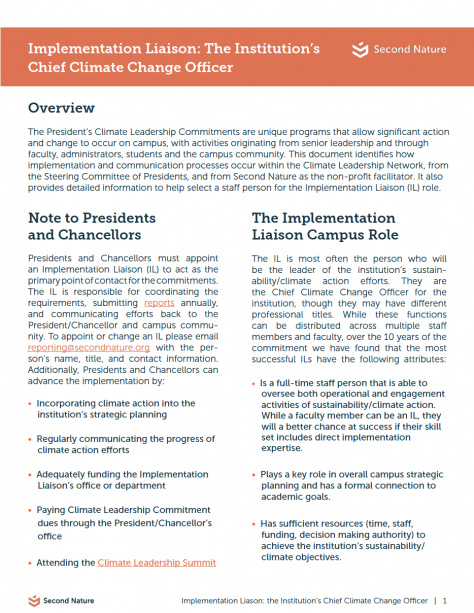 This document was developed as a resource for higher education institutions implementing one of the Presidents’ Climate Leadership Commitments. It outlines the concept of carbon offsets, how offsetting can be used in the context of climate action planning and achieving carbon neutrality, and what constitutes a quality carbon offset project. Download.